There are 34 universities in Singapore, of which six are national. The two best-known, the National University of Singapore (NUS) and Nanyang Technological University (NTU) both feature very highly in the QS World University Rankings® 2018, offering courses in a wide range of subjects to their student populations of over 30,000 each. Previously ranked only one place down from NUS, NTU overtook NUS in 2018 to now be Singapore’s highest-ranked university in both the QS World University Rankings® and the QS Asia University Rankings, ranked 11th in the world and first in Asia. NTU is highly regarded for its engineering courses, and in the QS World University Rankings by Subject it’s in the global top five for the broad subject area of engineering & technology, and is also ranked for civil engineering. In recent developments, NTU enrolled the first batch of students at its new Lee Kong Chian School of Medicine in the summer of 2013, as part of a collaborative venture with the UK’s Imperial College London. 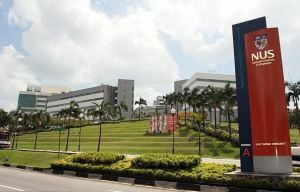 Singapore’s global superstar, the National University of Singapore (NUS) is currently ranked 15th in the QS World University Rankings, and second in the QS Asia University Rankings 2018. Within the QS World University Rankings by Subject, NUS displays a breadth of high performance which can be rivalled by very few universities in the world. The school is now ranked seventh in the world for the engineering and technology broad subject area, and eighth for chemical engineering. It’s also within the top 10 for social sciences & management. From the ground-breaking research of our faculty to the entrepreneurial spirit of our students , it’s safe to say there is never a dull moment at Yale-NUS. From the very beginning, Yale-NUS was designed to offer an education like none other. Drawing on the tradition of excellence at both Yale University and the National University of Singapore, Yale-NUS has met and exceeded the vision laid out by its founding faculty and administrators. Whether in the classroom, the laboratory or the common lounge in one of our Residential Colleges, Yale-NUS students evaluate not only of what they see in the world, but also why they see such things and where we will move in the future. Incorporating the experiences of students from over 50 countries, classes at Yale-NUS span the central knowledge of both Eastern and Western traditions. The Yale-NUS community, students and faculty alike, encourages celebration of difference as much as similarity. Innovation and adventure are paramount to the Yale-NUS experience. From summer sessions in Chile to class trips in Malaysia to creating and implementing our first student government, Yale-NUS students ar e doers. As you envision your four-year college experience as a time of intellectual and personal growth, we hope you will consider Yale-NUS.